It's Manchester United's final game against one of the top six teams in the Premier League and is by far the most difficult league game they have left with away games against Brighton and West Ham United before the final game of the season at Old Trafford against Watford remaining. This match will be Arsene Wenger's final game against Manchester United before ending his 22 year stay and Arsenal will try to give their venerable manager a good send off and Manchester United will be aiming to seal a top 2 finish and build up momentum for the big FA Cup final against Chelsea. While Manchester United may have had disappointing moments in the league with awful defeats to Huddersfield, Man City, Newcastle and most of all West Brom almost two weeks ago, Arsenal have had an even worse season with horrendous performances that have left them scrapping for sixth with Burnley hot on their heels and Everton (in eighth) almost as close to Arsenal (twelve points difference) as the North London side are to fourth place Tottenham (eleven points difference). Either way, both teams still have some very good international players who would fit into most teams quite comfortably. Never going to be anyone else. Cech has been very poor at times this season and will certainly be sidelined next season and Ospina had a great game against Atletico Madrid but is nowhere near the stature of the Spaniard who has 21 clean sheets this season with 17 in the Premier League and looks set to earn the Golden Glove after being nominated for the PFA Team of the Season for the fourth time in five years. Whilst Hector Bellerin has been in and out of form and consistently slated by Arsenal Fan TV, Antonio Valencia has been dependable and powerful in the right back position for United and offered a lot going forward this season. He may have to share the position next year with Timothy Fosu-Mensah as he is not getting any younger, but he has chipped in with three goals this season and one more noteably against Arsenal at the Emirates. Let's be honest really, there was no real chance that any Arsenal centre back was going to be in this squad, all of them have been inconsistent throughout the whole season and have shipped 46 goals in the League, which is one less than the likes of Brighton and Leicester City and three more than newly promoted Newcastle. 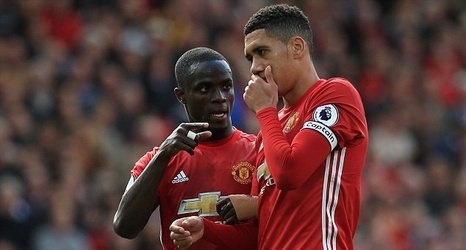 Eric Bailly has not featured for United since the Manchester Derby and ought to be reintroduced for such a crucial game as he is United's best defender and a powerhouse at the heart of the defence. Smalling has been in fantastic form lately and it is in games like this where he needs to step up and show his worth so that he may be back into the running for a World Cup position. One of Arsenal's best performers this season. Whilst Ashley Young has been praised and slated during parts this season, and Luke Shaw has been frozen out for the majority, Nacho Monreal has been a stalwart defender for the Gunners and realistically the only one who seems to remember how to defend for 90 minutes in that team. The Spaniard has also chipped in with five goals and two assists this season which is a tally that is level with Paul Pogba and surpasses the tally of the likes of Pedro, Mesul Ozil and Gylfi Sigurdsson and so Arsenal finally make the squad list with Monreal. Where would United be without Matic's presence in the midfield? He has been so consistent for United and for Chelsea since returning to the Premier League from Benfica. He is head over heels above any defensive midfielder Arsenal pretend to have and is a really easy pick. Aaron Ramsay is a cult hero at the Emirates and has had a very good season for Arsenal and has found the back of the net seven times which is more than Giroud or Willian. He is now the highest scoring central midfielder in Arsenal's Premier League history, surpassing Fabregas' tally of 58. He has also assisted his teammates seven times which also surpasses the now Chelsea midfielder who has a meagre 4 assists this season. Paul Pogba however has been both the hero and the villain during his return to Manchester United as his £90m price has often caused many to critique his performances very harshly at times. This season he has five league goals and a joint fourth high 10 assists (with Dele Alli) and has inspired United to big wins against Arsenal, Manchester City and Tottenham in the FA Cup semi final. When he is in the mood, he is unplayable and no one can get near him with his strength, skill and power, making him a complete midfield player. However he does falter at times and has been benched at times for poor form and deservedly substituted in games such as Newcastle, Tottenham and West Brom, but should be in this combined XI as he is a world class player. He has been an Arsenal sensation since coming to the Premier League and has scored six goals in nine games and made three assists as well. His blistering pace and smart play has made him an important figure for the Gunners since the departures of Walcott, Sanchez and Giroud as well as Mkhitaryan's injury. He has been consistently in the Arsenal squad unlike Rashford and Martial who have had good seasons as well, but cannot get past Sanchez and Lingard in the squad. Admittedly Lacazette has scored a reasonable 13 goals this campaign so far which is only three behind United's big Belgian striker but Lukaku has been so influential for United's season, providing seven assists and greatly needed hold-up play which provides the wingers chosen with more space to run into when going forward. He has scored 26 goals in all competitions for United and is likely to overhaul Zlatan's tally of 28 goals in all competitions and his 17 league goals and deserves his position in this squad.